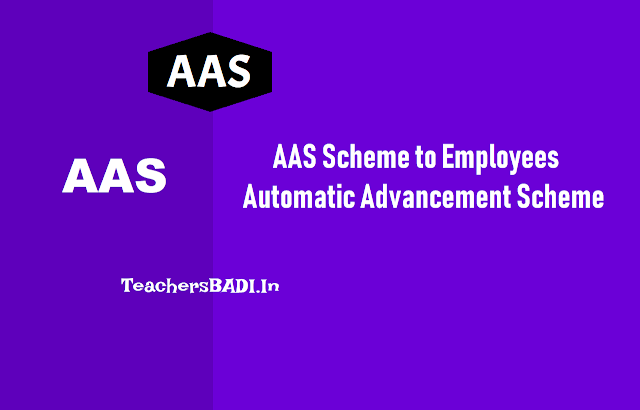 Home AAS AP Employees AP State Important Service Rules TG State TS Employees Automatic Advancement Scheme(AAS) For AP TS Employees, What is AAS? Automatic Advancement Scheme(AAS) For AP TS Employees, What is AAS? Automatic Advancement Scheme(AAS)For State Govt and Local body Employees: An automatic benefit/increment for those who were not able to get in time promotion, even though they were having Promotion Qualifications and Eligibility, but they are unable to get them due to non availability of that promotion posts/vacancies is called AUTOMATIC ADVANCEMENT. The AUTOMATIC ADVANCEMENT SCHEME(AAS) was introduced in PRC-1982. This has been introduced by state Government from 1-4-1981 by issuing orders vide G.O.Ms.No.117, Finance and Planning (FW.PRC-I) Department, date: 25-5-1981. This scheme has been extended to the teachers working in the schools of Government, Municipalities, Municipal Corporations, Zilla Parishads and Panchayat Samithees and also Aided Managements by issuing orders vide G.O.Ms.No.164, Finance and Planning (FW.P.R.C.-I) Department, date: 1-6-1982 & G.O.Ms.No.78, Finance and Planning (FW.P.R.C.–I) Department, date: 13-3-1984. AS per this scheme. 2) SPPI Scale for those who were completed 15 years. In RPS-1993 new scales were introduced for the period 8, 16 ,24 years instead of 10, 15 , 22 years. 2) SPPI Scale for those who were completed 16 years. In RPS-1999 pay scales the 24 years scale was cancelled and given one additional increment in SPPI only , Those who completed their 45 years of service were exempted from passing Departmental Test as per the GO Ms NO:225 dt:18-05-1999. In RPS-2005, 24 years scale SPP-II restored and allowed FR-22(B) fixation those got promotion after they got 8, 16 Scales. But FR22(a)(i) pay scale fixation inevitable those who completed their 24 years of service. To get SPP-I and SPP-II scales must possess the qualifications as per the promotion post. Clarificatory orders: For rectification of anomaly of a junior drawing more pay than senior on getting promotion to the higher post after getting the benefit of Automatic Advancement Scheme whereas the senior was promoted to the higher post without getting the benefit of the Automatic Advancement Scheme. Thereafter, orders were issued from time to time modifying and revising the Scheme based on the recommendations of the successive Pay Revision Commissions. If a junior got promotion after he/she availed AAS, sometimes he might get higher pay due to this when comparing with the senior. To avoid this kind of salary differences , the senior can avail Step-up facility with junior and to get equal salary. As per the new agreement with JAC the Government has taken decision to change the scales from 8, 16, 24 to 6, 12, 18, 24 Scales as per GO Ms No:96, Dt:20.05.2011. And it is force and implemented 01.02.2010.
particular post shall be appointed to the Special Grade Post Scale which is the next higher scale above the pay scale of the post he/she is holding. Special Promotion Post Scale-I is divided into two parts as "A" and "B"
An employee on completion of 12 years of service in a particular post shall be appointed to the Special PromotionPost Scale I-A. It carries the pay scale of the post next above the post held by him which happens to be the promotion post in the regular line as prescribed in the Service Rules. For appointment to the Special Promotion Post Scale I-A he/she shall be fully qualified to hold that promotion post as prescribed in the Service Rules. In other words, such of the employees who have put in 12 years of service in one post without getting any promotion, shall be considered for appointment to Special Promotion Post Scale-I-A. In case, the Service Rules do not provide for any promotion, the employee on completion of 12 years of service in a particular post shall be appointed to the Special Adhoc Promotion Post Scale I-A which carries the next higher scale above the Special Grade Post Scale. particular post, shall be placed in the scale of the post applicable to the second level promotion post to the original post held by him. This is subject to the condition that he is fully qualified to be promoted to such promotion post as prescribed in service rules and also that such post should belong to the regular line and not outside the regular line. This scale shall be called Special Promotion Post Scale II. In other words, such of the employees who have put in 24 years of service in one post without getting any promotion, shall be considered for appointment to the Special Promotion Post Scale-II. (ii) In case, the Service Rules do not provide for promotion at second level, the employee on completion of 24 years of service shall be placed in the scale of pay, next above the scale applicable to the Special Promotion Post Scale I-A. This Scale shall be called Special Adhoc Promotion Post Scale II. (iii) In case, an employee holding a post for which there is no promotion post under relevant service rules, he shall be placed on completion of 24 years in the scale of pay next above the scale applicable to the SAPP-I B. This Scale shall be called Special Adhoc Promotion Post Scale II. (iv) (a) The pay fixation on appointment to Special Grade / Special Promotion Post Scale-I-A/ Spl. Promotion Post Scale-II/ Special Adhoc Promotion Post I-A and Special Adhoc Promotion Post II shall be under FR 22 (a) (i) read with F.R.31 (2). (c) In case of Promotions from the Special Grade and Special Promotion Post I A & I B, the pay shall be fixed under FR 22-B. - SPPII/SAPP-II after 24 years. (II) The benefit of pay fixation under F.R.22-B be continued on promotion even if the employee had derived the benefit under SG or SPP I-A and SPP I-B and if this results in the senior drawing less pay than the junior, the pay of the senior be stepped up to that of the junior subject to the conditions enumerated in G.O.Ms. No.297, Fin. (PRC-I) Dept., dated: 25- 10-1983. (V) The benefit of Automatic Advancement Scheme shall be continued up to and inclusive of Grade-XXV in the revised scales i.e., Rs.49870-100770. (VI) The employees after availing the benefit of SPP-II are not eligible for the Automatic Advancement Scheme on their further promotions. (VIII) The Scheme shall be deemed to have come into force on and from 01.07.2013. (IX) The salary as per the pay fixation under this scheme in the Revised Pay Scales, 2015 will be paid in cash from the month of March, 2015, payable in April, 2015. As regards the arrears of pay fixations as per the A. A. Scheme in the Revised Pay Scales, 2015 from 02-06-2014 to 28-02-2015, orders will be issued separately.